Most homeowners and building conservators are all too familiar with the issues associated with wasps or mice in the attic, or with playing host to a family of bats. While finding lichens in the loft might leave building owners or managers wondering where to turn, lichens shouldn’t be a cause for concern. In fact, they could constitute an important archaeological discovery. A team of lichen experts from the Royal Botanic Garden Edinburgh funded by the Leverhulme Trust is currently building collaborations across Britain to explore the pre-Victorian landscape using evidence supplied by the lichens preserved in historic buildings. Lichens are largely familiar as the colourful, leafy rosettes that adorn tree trunks or the rich and intricate patterns that encrust old rock walls, gravestones or garden urns. They are also extremely valuable environmental indicators. Because they are very particular about where they grow, lichens can be used to describe and interpret features of their wider context including air quality, local climate, and techniques of woodland management. Oliver Rackham, in The History of the Countryside, claims that ‘examining the timber and underwood of a medieval building may bring back to life the trees and the men of a long-vanished wood’. (1) Lichens can add other dimensions to that reconstruction, too. mountains, many are unable to tolerate major changes in their growing conditions. Lichens on tree bark will die when the trees are cut and converted to timber for construction. However, because lichens are physically durable, they can retain their structures and often remain fully recognisable like miniature dried flowers. And there they stay, sometimes persisting on the timber for hundreds of years, resisting decay and the ravages of time (provided they are not obliterated by paint, sandblasting or stripping). but they can be found in many different and surprising places on historic wooden building materials. The lichen resource ranges from the bog-preserved Neolithic hazel hurdles that made up the trackways of the Somerset Levels, to the timbers and underwood of historic buildings. Those which grew on big trees might appear on the bark of large waney-edged timbers, especially in out-of-the-way places like roof spaces; or they might completely cover the bark surfaces of the hazel sticks used to make wattle and daub panels (see top illustration). 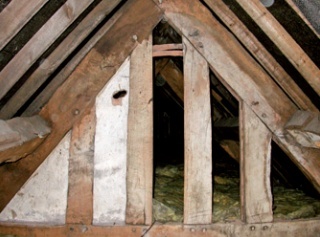 Even relatively high-status buildings frequently include roof timbers with small areas of bark on them (above right). The odds might seem to be stacked against the preservation of bark in old buildings. Historically, the value of oak bark to the tanneries and the obvious craftsmanship that went into timber conversion are among the reasons why bark might not be expected to survive. Nevertheless, the presence of bark on timber is surprisingly widespread. In a survey of over 40 private buildings all but one had bark and at least half contained preserved lichens. 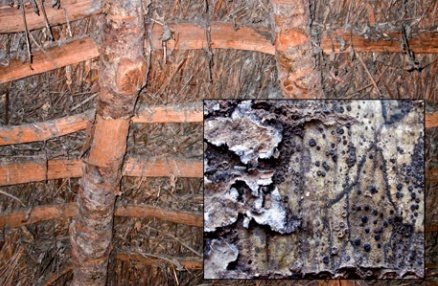 The smaller cross section of rafters and joists in thatched roofs also often means more bark and more lichens (facing page, top right), and roundwood (wattles or thatching materials) is often completely covered with lichens. Significantly, in old wattles, where the wood has turned completely to dust, an outer core of bark, along with its lichens, can often be salvaged. That fact makes old wattles very valuable, even when the wood is in poor condition. From an archaeological standpoint, lichens are the premier environmental indicators. Since each species of lichen grows in a specific ‘niche’ or environmental setting, the presence of a particular lichen on historic building timber can tell us what kind of location the tree was growing in before the timber was harvested. For example, some communities of lichens are typical of agricultural settings where there is strong light. As a preserved archaeological sample, such lichens would suggest that the trees from which that part of the house was built came from a hedgerow. Other species were limited to ancient woodlands and so provide information about the history of a particular area of woodland and how long it has existed in the landscape. Other lichens are sensitive to different forms of pollution, and still others grow in different climates. Finding many different types of lichen in the buildings of a particular village allows lichenologists to piece together the conditions that would have been present in the landscape when the trees were harvested for building, and can shed light on woodland structure and management techniques. For example, wooden building materials recovered during the dismantling of a 16th century cottage from Lower Greensand, West Sussex, included wattle, daub and various timbers. (2) Lichens on these materials were identifiable to species-level and were remarkably well preserved on ash staves (left). Significantly, the preserved set of lichens was absent from present-day Sussex, and is now more typical of woodlands in the clean-air environment of West Somerset, Devon and Cornwall. 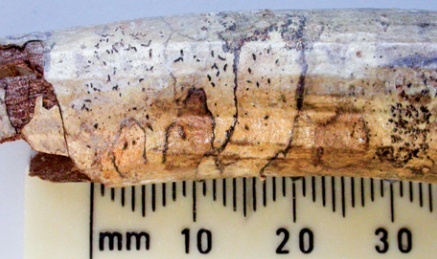 These differences in the lichens present on the 400 year old preserved ash staves and the modern equivalents from Sussex were tentatively attributed to the effects of pollution. Pollution accounts for one of the largest and most important differences between the British environment now and in the pre-industrial period. A wealth of historical information can be gleaned from the careful study of preserved lichens in buildings. First, the air was cleaner before the industrial revolution than it is today. Saxon charters frequently noted the presence of ‘hoar trees’: trees used as boundary markers that were covered in bushy, beard-like lichens. (3) In contrast, a survey of lichens from the 1970s showed that huge parts of Britain were devoid of lichens. Trees in these areas were completely lichen-free as a consequence of severe air pollution, especially acid rain. Although acid rain has all but disappeared in Britain, lichens are only now recovering. Indeed, it is still possible to explore urban or suburban British woodlands and see only bare tree trunks which would, historically, have been clothed in a rich variety of lichens. Preserved lichens can therefore provide clues as to the health of the environment in pre-industrial Britain. That information could also be used to set new targets for environmental remediation. The lichens in Britain are probably the most widely studied, and the best-known in the world and the special requirements of each species are readily characterised. A set of historic lichens discovered in an attic can be used to generate a quite specific picture of the type of environment in which those species would be found today. Part of the research for the ongoing project at the Royal Botanic Garden Edinburgh involves comparing modern lichen communities sampled from different settings, with historic communities from archaeological studies, providing a reliable means of inferring what historic environments were like. The distribution and abundance of contemporary lichen communities can be used as a yardstick for interpreting historic communities. the lichens in our vernacular buildings have only recently become subject to detailed investigation. Unfortunately, the value and vulnerability of this resource is not yet widely appreciated. All too often, we hear of old wattles ending up in skips or on bonfires. Those involved in working with historic buildings should keep a keen eye out for discarded wattles, for example where an infill panel in a half-timbered wall has been cut open or a complete panel replaced. The Royal Botanic Garden Edinburgh would be very grateful for information about discarded wattles, especially if traces of bark are present on them, and will supply the necessary postal materials for samples to be sent in (please use the authors’ contact details supplied below). REBECCA YAHR and CHRISTOPHER ELLIS study lichen diversity at the Royal Botanic Garden Edinburgh. Rebecca Yahr is currently working on archaeolichens and lichen evolution, and Christopher Ellis’ focus is on how lichens respond to environmental change. More information on the RBGE’s research on lichens and biodiversity can be found here. The authors can be contacted by phone on 0131 248 2993 or by e-mail at r.yahr@rbge.ac.uk.